I am always fascinated with ancient and alternative healing systems that are still effectively used thousands of years later. Most people have heard of traditional Chinese medicine and many have experienced acupuncture, tai chi, qigong, or even Chinese herbalism. Ayurveda, on the other hand, may be a mystery to you. Translated from Sanskrit, “Ayurveda” means the “science of life” or “life knowledge.” The discipline’s healing principles originated over 5,000 years ago in northern India. I recently had the pleasure of taking an introductory course on Ayurvedic medicine. Every key concept revolves around the three primary life forces or constitutions, known as doshas: vata, pitta, and kapha. The mental aspect of Ayurveda is also important, and includes concepts like sattva (clarity), rajas (distraction), and tamas (dullness). Like most forms of alternative medicine, Ayurveda is not a one-size-fits-all approach to health. In fact, the holistic mindfulness of Ayurvedic medicine offers specific methods of yoga, exercise, meditation, detoxifications, bodywork, psychological intervention, and oil and herbal therapies for each constitution. In Ayurvedic medicine, amla, or amalaki, is considered a very powerful rejuvenative fruit. The amla tree, native to Nepal and India, is also known as the Indian gooseberry (Emlica officinalis). The amla fruit is rich in vitamin C and other antioxidants, such as zinc, vitamin A, carotene, vitamin E, ellagic acid, gallic acid, gallotannin, and corilagin. It also contains iron, B-vitamins, polyphenols, vitamin K, fiber, manganese, magnesium, and calcium. All these nutrients in the amla fruit help balance all of the doshas. 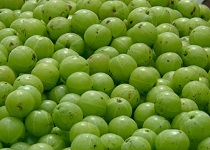 It’s not surprising that amla fruit is used in many Ayurvedic preparations. Moreover, it can help treat several health conditions, such as diabetes, bone health, colds, headaches, cataracts, bleeding disorders, colitis, gastritis, vertigo, mental disorders, respiratory disorders, palpitations, osteoporosis, anemia, hemorrhoids, diarrhea, dysentery, and cancer. In a study published in the journal Nutrition and Cancer in 2013, researchers found that amla may help in the treatment of human papilloma virus-induced cervical cancers. They observed the anti-cancer effects of the fruit through inhibitory activator protein-1 (AP-1) activity and HP gene expression transcription, which can lead to cervical cancer. Guggul (Commiphora wightii) is a top Ayurvedic herb for weight loss. It is the sap or gum resin from the Mukul myrrh tree, which is commonly found in northern India, central Asia, and northern Africa. In an open comparative study published in the Journal of Postgraduate Medicine in 1995, guggul helped induce weight loss in obese adult patients over 90 kg for a 30-day period. The participants also walked for 30 minutes daily and ate a calorie-controlled diet. But how does guggul help with weight loss? It helps stimulate the thyroid, increases lipid metabolism, inhibits fat cell formation, and induces death in fat cells. Guggul can also help with atherosclerosis, diabetes, arthritis, bronchitis, gout, nervous disorders, skin diseases, ulcers, cystitis, and tumors. Before I began the course, I decided to try my hand at Ayurvedic cooking. After all, I am a fan of many ethnic dishes. Asafoetida, or hing, is a gum resin and spice in the popular Ayurvedic dish for digestion called kichadi. The spice is known as a sedative, expectorant, stimulant, and antispasmodic. It contains many important nutrients such as B-vitamins, carotene, iron, phosphorus, calcium, ferulic acid, azulene, luteolin, vanillin, a-pinene, and a-terpineol. Asafoetida is useful for ear pain, whooping cough, asthma, convulsions, hysteria, palpitations, epilepsy, arthritis, flatulence, indigestion, abdominal distension, and other digestive issues. It is also used to increase libido, and helps men with impotency. Asafoetida also helps lower hypertension, is useful for diabetics, and can lower blood sugar levels. Ashwagandha is another common Ayurvedic herb, used for immunity, strength and recovery, cognitive development, and mental readiness. Other herbs used in Ayurvedic medicine include holy basil (or tulsi), neem, brahmi, bibhitaki, haritaki, shatavari, trikatu, and gotu kola. It’s important to note that some of these Ayurvedic herbs may be a challenge to find. You have to track down a specialty store or Indian grocery store. Common herbs like turmeric and ginger can be found at most health food stores, as well as most grocery markets. “Ayurvedic Medicine,” Dr. Andrew Weil web site; http://www.drweil.com/drw/u/ART00454/Ayurvedic-Medicine.html, last accessed March 13, 2015. Mahata, S., et al., “Anticancer activity of Phyllanthus emblica Linn. (Indian gooseberry): inhibition of transcription factor AP-1 and HPV gene expression in cervical cancer cells,” Nutrition and Cancer 2013; 65 Suppl 1: 88-97, doi: 10.1080/01635581.2013.785008. D’Souza, J.J., et al., “Anti-diabetic effects of the Indian indigenous fruit Emblica officinalis Gaertn: active constituents and modes of action,” Food & Function, April 2014; 5(4): 635-644, doi: 10.1039/cfo60366k. Bhatt, A.D., “Conceptual and methodologic challenges of assessing the short-term efficacy of Guggulu in obesity: data emergent from a naturalistic clinical trial,” Journal of Postgraduate Medicine, January to March 1995; 41(1): 5-7. Mahendra, P., et al., “Ferula asafetida: Traditional uses and pharmacological activity,” Pharmacognosy Review, July to December 2012; 6(12): 141-146, doi: 10.4103/0973-7847.99948. “Asafoetida,” WebMD web site; http://www.webmd.com/vitamins-supplements/ingredientmono-248-asafoetida.aspx?activeingredientid=248&activeingredientname=asafoetida, last accessed March 13, 2015. “Asafoetida,” herbs info web site; http://www.herbs-info.com/asafoetida.html, last accessed March 13, 2015.